The overall auction season of Modern and Contemporary Arab, Iranian and Turkish art raised $13,948,000 (excluding buyer’s premium), exceeding the pre-sale auction expectations of $9,206,000 to $12,810,000. The auction sales were 62% higher than spring 2014, helped by the addition of Sotheby’s $3.3 million sale of Modern and Contemporary Middle-Eastern art in Doha. If we exclude the Sotheby’s result and only look at the Christie’s Dubai sale, the total was still 24% higher than in the spring of 2014. The healthy increase in overall sales was a result of realistic estimates and increasing demand for lots selling in the $100,000 to $500,000 price band. This price segment accounted for 60% of the overall auction turnover, up from 34% in spring 2014. More realistic estimates generated significant demand at Christie’s, with 79 out of 122 lots selling above the average estimate, resulting in an ArtTactic Auction Indicator for Christie’s of 66, up from 38 in October 2013. 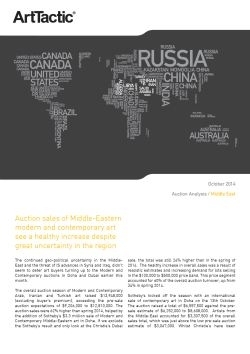 Sotheby’s achieved an ArtTactic Auction Indicator of 47 for the Middle-Eastern lots sold in Doha, where 21 out of 45 lots sold above the average pre-sale estimate. Only 9% of the lots were bought-in at Christie’s versus 20% at Sotheby’s.